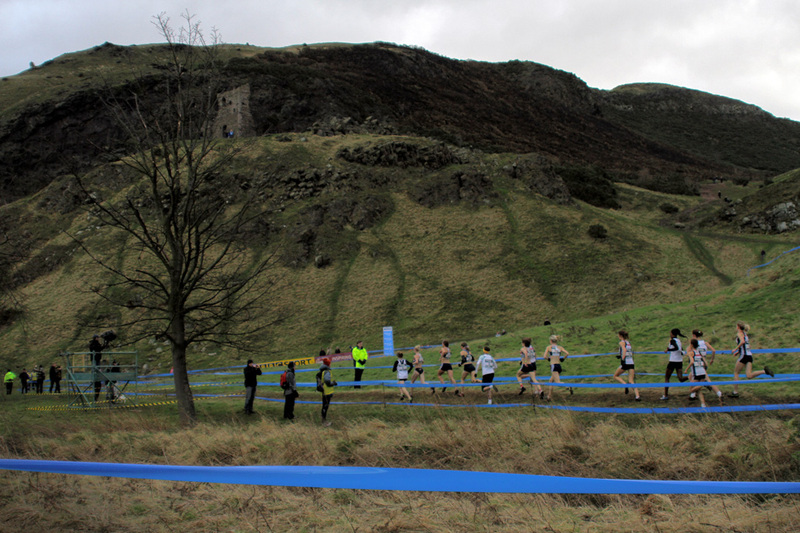 Fionnuala Britton took a tumble early in the 2013 running of the Bupa Great Edinburgh Cross Country International Challenge Race. But the defending champion from 2012 recovered and went on win in dominating fashion. Her 16-second final margin kept her current campaign on the same impressive track as last season, adding the Great Edinburgh repeat title to the repeat Euro Cross title she won in Hungary four weeks prior. Facing a strong British team, along with perennial European challenger Ana Dulce Felix and a battery of Americans, the Dublin-based cross country star overcame a fall while exiting a creek early in the proceedings. Britton scored a 20-second victory last year on the same hilly course, but faced a more accomplished field this time around: Olympians Julia Bleasdale and Sophie Duarte, as well as Felix, were ultimately left in the Irishwoman’s wake. In the Men’s International Challenge Race, Sean Quigley wore the USA vest for the third time in his career and placed eleventh overall, fifth among Americans. The US contingent won the team race, and Quigley bettered two of his compatriots who had beaten him at Club Nationals, the USATF team selection race.